Anything that causes compression or irritation of the nerve can lead to the development of a neuroma. One of the most common offenders is wearing shoes that have a tapered toe box, or high-heeled shoes that cause the toes to be forced into the toe box. People with certain foot deformities – bunions, hammertoes, flatfeet, or more flexible feet – are at higher risk for developing a neuroma. Other potential causes are activities that involve repetitive irritation to the ball of the foot, such as running or court sports. 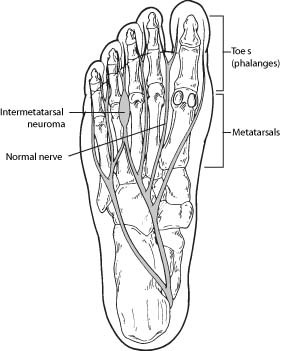 An injury or other type of trauma to the area may also lead to a neuroma.